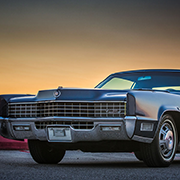 This part of my website is dedicated to the 1967 Cadillac DeVille. On the following pages you can find lots of information about 1967 Cadillacs in general and my 67 Convertible in particular. Please use the navigation menu above to navigate through my site. On the history page you can get information on how I found the car and its history. There are also lots of pictures of the car before the restoration. The restoration page is about the intense restoration with many pictures and one video of the process and a detailed report. You can find lots of great images of the finished car in the image gallery. The next chapter is about the 1967 Cadillacs in general. Here you can find all the technical data, pictures of all the 1967 models, a complete color chart for the exterior colors with all the codes and a special section of the convertible interiors. There also is another chart for prices, options including all codes, and the production totals. Next big chapter is the photo gallery with tons of pictures of my car and some other 67s from fellow Cadillac enthusiasts. There are also 19 Cadillac ads there. Make sure to also visit my 1958 Eldorado Seville section and drop me a message if you like my pages! Hope you'll enjoy this site!